I notice lately that I'm having trouble focusing. I must have been too unfocused before to have noticed. At work, I jump mid-sentence from composing an email to an author, to checking what the weekend weather is so I know how to pack for New York, to adding a new blogger to my review copies list, to checking my Twitter feed. The emails keep popping up in my inbox and the to-do list is growing tentacles. I know this is typical of modern life as most of us live it. But it wipes me out. I've been walking home from work lately, but instead of using that time to breathe and recharge I'm still thinking about work, as well as the 91 things I need to do at home (Yes, 91. I counted.) I get home, throw a packet of Tasty Bite Madras Lentils in the rice cooker, and if our schedules intersect, have dinner with Mike. By that time I'm feeling as worn out as an old sneaker and I berate myself for not being more productive, for letting another day go by without getting more things done. Sometimes all this mental stuff depresses me. Now that it's Spring, I feel the cartoon cloud over my head lifting, but the obligations and projects and should-dos are still obscuring the blue sky and brilliant flowers. And then I feel guilty that I'm not savoring the nice weather I wished for all winter! The tyranny of too much stuff, whether it's mental stuff or that stuff I buy myself because I love acquiring new and shiny things, can be suffocating. It's like when I go to our local craft store, Paper Source, and pick out a few items for making my own cards from their modest but well-selected inventory. Then I go visit my mother in New Jersey, where she takes me to Michael's. There I'm confronted with hundreds of options of cuteness--and that's just counting the new Martha Stewart Crafts line. I get a dizzy, almost out-of-body feeling, like I've had too much caffeine. No end of choice gives me a headache. This weekend we opened the family cabin in Fryeburg, Maine. I spent Saturday morning vacuuming dead insect parts from the windowsills of the bunkhouse (where Mike and I usually sleep because Mike likes the composting toilet, or what I refer to as the "litter box.") Strings of spider webbing stuck to my fingers like cotton candy. Outside the bunkhouse, I picked up old tree branches and tossed them in a neat pile in the woods. It was the most calm and focused I had felt in weeks. Our cousin Mikki calls the cabin "the happy place" and I agree. Not that we sit around all day smiling and singing songs. It's just that it's one of the few places left where our lives get simple again. Our options are manageable--read a book on the hammock or on the comfy old couch in the cabin with its panoramic view of Lovewell Pond? Go into North Conway for fresh vegetables or outlet shopping, or spend an hour splashing in the water? I tend to bring some of the paperwork of my ordinary life to the cabin, but then I forget about it because I've picked up a T.C. Boyle novel at The Local Bookie. Sunday was a glorious day, sunny but with a gentle breeze which helped keep the mosquitoes at bay. I sat in an Adirondack chair facing the pond, an IPA on the armrest like a Corona commercial, a book in my lap. 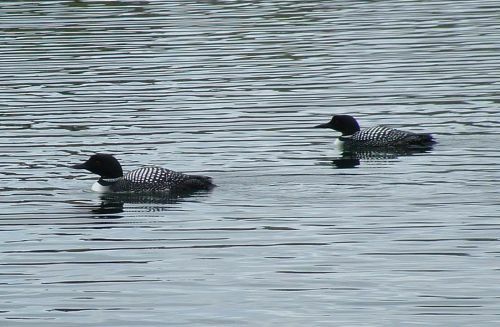 From time to time I'd look up and watch a pair of nesting loons diving in and out of the water. That's all they do all day is dive for food and then emerge--like synchronized swimmers--right next to each other. The book I was reading was Twitter for Dummies, a compromise between studying up on social media and nature watching. I actually found I could concentrate on what I was reading, even with the occasional looking up to see the late-afternoon sunshine cast perfect photographer's light over the rippling waves. Life can be chaotic, overwhelming, depressing, alienating, hard. But that's why nature is so important, so crucial. The loons, the pine trees, the quiet--that's what restores us. Until the neighbors arrive with their power tools, leaf blowers, and mobile lawnmowers. I turned 37 yesterday. A few days before my birthday, I had complained to my mother about it, and she said, "This is a good time in your life, Jenn. Think of how you'll feel when you're 47, 57, 67?" My mother is a sensible woman. I take after my father. I wonder, is it time to subscribe to More magazine, the one for women over 40? When I visit my parents' house and read my mother's back issues I feel like it will be years and years before I will be in this magazine's demographic. Each issue is filled with stories of successful women with gray hair, dressed in suits and white blouses and long layered necklaces and maybe some sort of short-heeled boot. They have three kids and an architect husband, started their own business or switched careers in mid-life, and give to various charities while dropping $500 on handbags. I don't relate to these women. They're not me. A couple of years ago I picked up a free book of essays by women over 40. I shelved it way in the back of my bookcase, figuring I'd want to read it someday. That someday is now sometime soon. You know you're going to get older, but like a shark attack, you think it won't happen to you. I hardly ever go in the water, you think. But then one summer day you find yourself snorkeling with your husband, and you feel a tug at your ankle. You realize (too late) that you are no exception. I've spoken about my fear of aging before so I won't carry on about it here (or not anymore than I already have). I think I've discovered what is at the heart of this fear--I'm having an identity crisis. An identity crisis is not the same as a mid-life crisis. I'm not going to the gym five days a week and buying myself a bitchin' Camaro. Simply put, I don't know how to be a woman in her upper-30's. What should I be doing? What will make my life rich and meaningful? Am I doing enough now to guarantee a happy future? I haven't even rolled over all my 401K accounts yet! I'm sure a lot of this has to do with not having children. Women who become mothers in their thirties can focus their attention on their child's milestones while neatly avoiding their own. I'm not saying mothers don't have the occasional identity crisis, too, but for the most part they know what their purpose is for the next twenty-one years: to raise an intelligent, happy, healthy, well-adjusted human. Beyond that...well, they'll worry about it when it happens, in their Empty Nest days. The thing I need to do is to make my life as it is now in the present moment the best life it can be. So I'm 37, so what? Some interesting, dare I say hip people, are my age. Or at least there must be a few. A quick Google search finds...um...Dave Chapelle (what's he up to now? ), Vera Farmiga (broke George Clooney's heart in Up in the Air, you go, girl! ), Heidi Klum (although I stopped watching Project Runway when it moved to Lifetime I still admire her for turning her modeling career into a hit show. I hear this past season was good.) Further down the list we find...Joe the Plumber (listed as "activist"), Monica Lewinsky, Tori Spelling (husband-stealer), Tina Yothers (my least favorite character on Family Ties), terrorist Richard Reid (the shoebomber is 37 this year?) . Hmmm. I could look to my friends, many of whom are also 37 this year. But comparing my life to theirs isn't helpful, either. We're all at different places in our lives. Using friends as a yardstick for your own goals and accomplishments is a surefire way to stop being friends. Anyway, I've always set my watch to a different time then them. Maybe I just need to stop ruminating about my age and start living it. 80-year olds are proud to have made it to 80--they announce it every chance they get. If I make my late thirties as good as my late-twenties maybe it will cease being a big deal every year. When I turn 40 I'll laugh at my former neurotic self. While driving my red Mini convertible down the Pacific Coast highway.